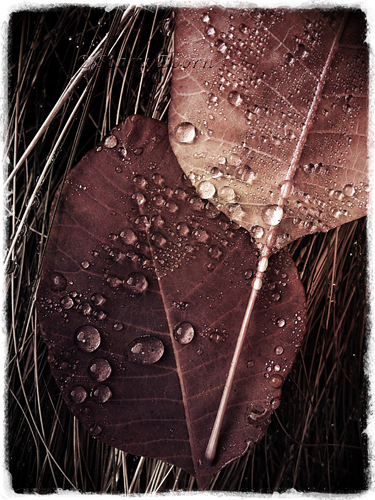 I love to photograph leaves in the fall when they have freshly dropped from tree branches and vines, often blanketing the ground and creating patterns that Joseph’s Technicolor dream coat may have been fashioned after. And I’ve grown to love the fall foliage here in the Bay Area. It is a much gentler transition than my East Coast home where whole mountainsides are blazing red and orange with Maples interrupted by yellow patches of Birch. Many times the simplicity of a single leaf tells its whole story without including every detail of how it got to its final resting spot. In the first two images below, notice how the image on the left is basically a record shot: the bench, the fallen leaves, the sidewalk and a hint of the tree trunk. The second image is more intentionally honed. 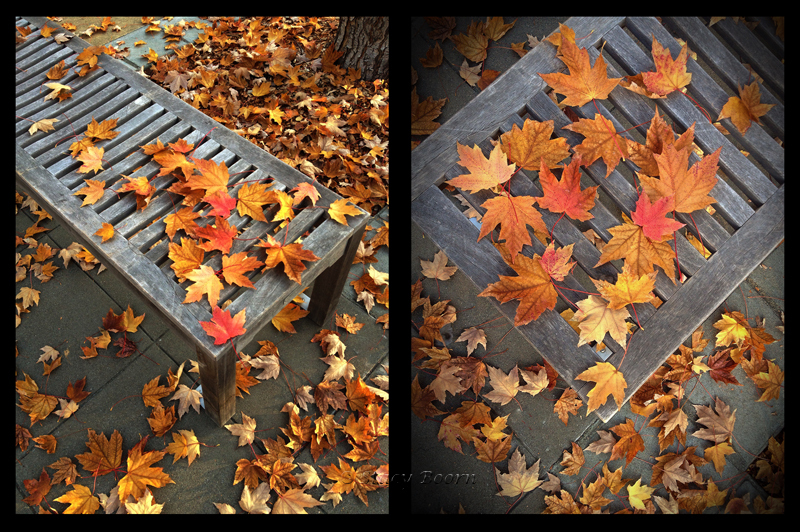 The maple leaves on the bench are photographed from above. I was hoping to get the perspective of what you might see if you were the branch from which these leaves were recently released. The maple leaves on the bench are obviously larger than those on the ground, but you have to look twice to realize why that is so. From this vantage point you cannot see the bench legs and don’t really know if the bench is flat on the side walk or floating above it. Without seeing the tree you still have the feeling that it is there and naked! The maple family is referred to as Acer, a word that has its roots in the Latin word meaning “sharp” due to the distinctive points of the maple leaf. Maple trees are renowned not only for being featured on the Canadian flag, producing vast quantity of delicious maple syrup or making great guitars and baseball bats, but also for the appearance and quality that enables them to transition a landscape from one season to another. Like nature, our lives are filled with many kinds of transitions. Most people, myself included, dread transitions. They often include hard emotional processes. We can’t always see or even imagine the bright future that will eventually unfold. Yet the fallen leaves are a sign that winter comes not as finality but as part of a cycle that will eventual lead to new births. I offer these images as a prayer of hope for the people in the Philippines who have been thrust into tragic transitions by typhoon Haiyan. With winds of over 200 miles per hour and torrential rains, it has caused massive destruction, loss of lives and forced millions of people to flee their homes. Our help is needed to make a difference in affected areas. Lutheran Disaster Response is responding to the most urgent needs of food, water, clothing, shelter, sleeping material and medicine. Possible assistance will also include things like helping those whose livelihood of fishing or farming has been destroyed. You may make checks out to Ebenezer Lutheran Church (herchurch), and we will send them on to Lutheran Disaster Response, or you may contribute directly to LDR online. Gifts designated for “Pacific Typhoon Response” will be used in full – 100 percent – to help with immediate and long-term needs. Your generous offerings of prayer and financial support will help those affected as they journey to recover from this season when not only the leaves, but the skies were falling. 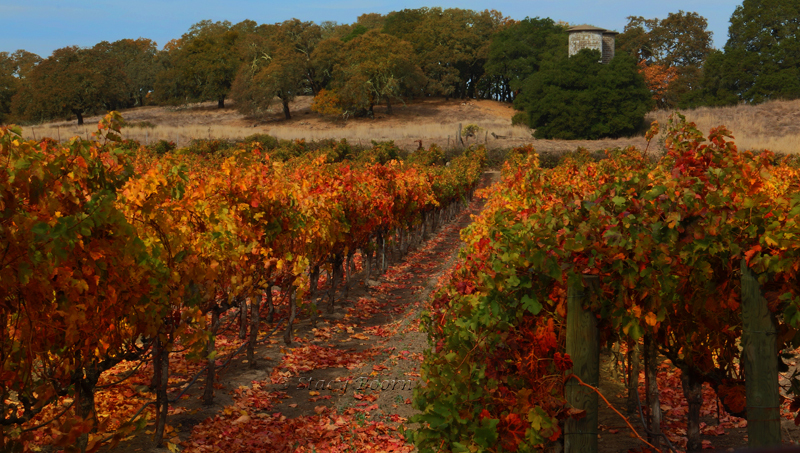 This entry was posted in Weekly 2 and tagged Fall Foliage, Jack London State Park, Maple leaves, Maple Trees, Maples, vineyards. Bookmark the permalink.